Upon submission of papers for removing conditions on residence, applicants are eager to know how long they have to wait for the approval and what further actions they need to take. Though there is a general scheme for processing Form I-751 applications, the actual timeline depends on several factors, including the USCIS workload and office where the documents were submitted, as well as on the compliance with the agency requirements for filing the petition. Here is a basic scheme for the applicants that covers the most part of cases, but there can be some variations in the timeframe and procedures when it comes to specific scenarios. When the documents are delivered to U.S. Citizenship and Immigration Services, the agency responds by sending Form I-797C to the applicant, informing him or her that the petition is received and its processing starts. This occurs within 3-5 weeks of the date of submission and confirms that a year is added to applicant’s conditional residence status, during which the agency will be processing the petition. This means that the applicant has to carry both expired green card and notice received from USCIS for proving his/her lawful status. However, this is applicable only to those petitions, which were submitted as required and thus were accepted by the agency. If the papers weren’t duly prepared, USCIS can either reject the petition by sending a corresponding letter or mail a Request for Evidence, compelling the applicant to provide additional documents. Needless to say, both options add time to the process, and therefore it is essential to fulfill all USCIS requirements for filing the form in order to avoid delays. Note: The USCIS letter comes with a receipt number to be saved for further use, for example to check applicants’ case status via USCIS website. If an applicant doesn’t get the letter within the specified time span, it’s better to make an inquiry through the website to eliminate further delays. You need to understand that with almost 9% of Form I-751 applications rejected, failing to correctly submit the petition is more than real. At the very least, this results in frustrating loss of time, while the worst scenario involves immigration issues. That’s why we offer a smart step-by-step guide on how to properly submit a Petition to Remove Conditions on Residence, preventing any possible delays and ensuring that your application will be accepted. Then, USCIS will notify you about time and place of biometrics screening, also known as biometrics appointment. Generally, the applicants are asked to come to the closest Application Support Center, where their fingerprints are taken for further background investigation. There is nothing to worry about, since the procedure is common to all the applicants seeking for lawful permanent residency. Note: The best strategy is to attend the screening as initially scheduled, but an applicant is permitted to ask for an earlier date, in case there is an urgent need to go outside the United States before the scheduled screening. Here is some additional information on biometrics appointments. Usually the screening lasts no longer than half an hour. In addition to getting your fingerprints, USCIS will have your photograph taken and also will ask to provide your signature. When going to the screening, don’t forget to take a government-issued ID with a photo such as a green card, military ID, DL or state-issued identification card, as well as a national passport or ID. If you fail to provide a proper ID, you won’t be allowed to a USCIS center, so check the list of items to be taken with you specified in your notification. Note: If there is any chance you do have criminal records, it’s smart to consult an immigration attorney, who can pursue a background investigation beforehand and address its results as appropriate. Otherwise you might not be entitled to earn your 10-year green card. It is seldom the case when the applicants who submitted a joint petition and confirmed their good faith marriage by providing sufficient evidence receive the request from USCIS. 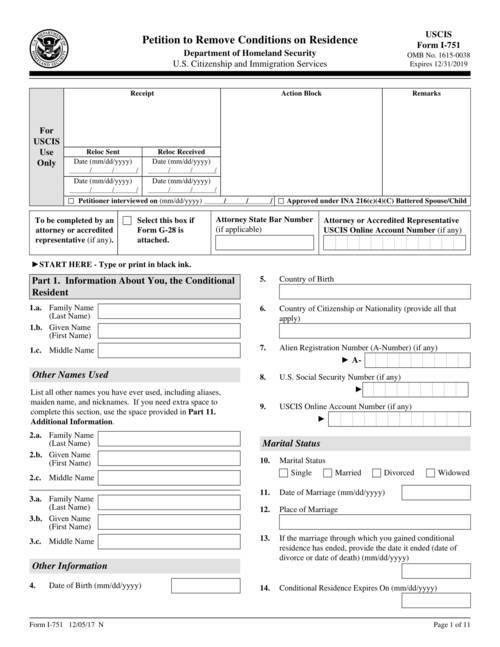 Yet, if there is a lack of the evidence and USCIS has some grounds to suspect a sham marriage, an applicant will be mailed the letter, requesting additional proofs. Note: The request can be sent even to those applicants, who submitted their petitions with a waiver, so the best you can do in order to avoid delays is initially collect and provide all possible evidence of a good faith marriage. In many cases interviewing is an essential part of the process, serving to confirm a good faith marriage. Nevertheless, some joint petitioners can skip this step thanks to their well-grounded applications complemented with strong evidence. They are never asked to have the interview, and you can be one of them if taking the submission of documents very seriously and learning how to skip the appointment. Note: If an applicant gets the notice with the interview scheduled, it is critical to come as required, since otherwise USCIS can terminate the applicant’s conditional residency. Moreover, skipping the interview without a reasonable excuse can lead to applicants’ deportation. When you are interviewed and your documents are processed, USCIS may decide to approve your petition – in this case, you’ll get a new 10-year green card by mail. Those applicants who are not approved will receive a denial letter mailed by the agency, containing legitimate grounds for the decision. Note: If the applicants happened to relocate during their application processing, they are required to inform USCIS about their move. This must be performed within 10 days of the address changing by forwarding Form AR-11 and calling at 1-800-375-5283. Also, don’t hesitate to contact the agency by making a case inquiry, if you failed to receive your new card by mail. As a rule, the process of removing conditions on green cards lasts 6-12 months after the submission. That said, the applicants should understand that this is an average timeframe, while there can be additional requests from U.S. Citizenship and Immigration Services, extending the timeframe. On the other hand, sometimes USCIS decides to skip the interview, so time limits can be shorter. Anyway, keep track of your case progress by using the agency website, where you can check the case status/processing times or make an inquiry.